PM: Let's build Welsh powerhouse Jump to media player Wales has the potential to be a powerhouse, with clearer powers for the assembly, David Cameron says. 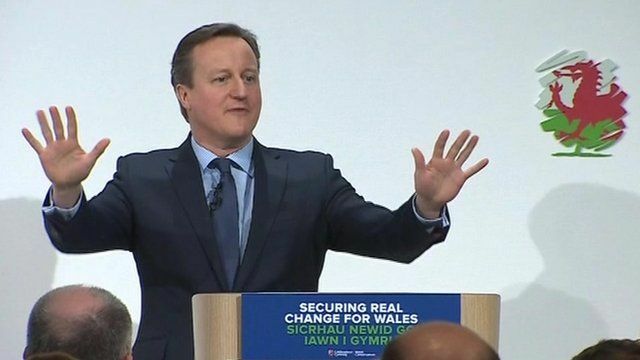 Wales has the potential to be a powerhouse, with clearer powers for the assembly, David Cameron has said. He told the Welsh Conservative conference in Llangollen that Wales was "motoring ahead" with the UK's fastest growth rate outside London. The prime minister hailed the upgrading of the main rail line to Swansea as contributing to prosperity. However, he claimed the future was "not guaranteed" and said the Welsh economy was reliant on the "right choices" being made by voters in the assembly election and the EU referendum.